Here are five takeaways from the third preliminary game of the 2019 IIHF World Junior Championship. The U.S. fell to Sweden, 5-4, in overtime, on Saturday at Save-On-Foods Memorial Centre in Victoria, B.C. Trailing by three goals entering the final 20 minutes of the game, Oliver Wahlstrom stated in the intermission interview that this game wasn’t over. He was right. After the U.S. fell behind 4-0 after a sensational backhander by Swedish captain Erik Brannstrom, they turned a corner. Mikey Anderson tallied for the U.S. with 10:26 remaining for a power-play goal, setting the stage for a dramatic four-goal third period to tie the game. It showed a lot from this group to not just roll over, especially with the deficit at four goals and only half of a period remaining. Earlier in the tournament Jason Robertson told us that this team has the heart to battle back from adversity, and they really showed it tonight. The comeback doesn’t happen without the heroics of Ryan Poehling. One of five returners from last year’s bronze-medal winning team, Poehling put together a natural hat trick in a span of 6 minutes and 11 seconds. He scored two goals in the final minute, just 11 seconds apart. The Montreal Canadiens first round selection in 2017 (25thoverall) has been heralded for his 200-foot game. He showed it with a stellar play on 5-on-3 penalty kill, stripping Erik Brannstrom and clearing the puck when Sweden looked prime to strike and double their lead in the first period. All three of his goals came from being in the right spot and finishing. The first one, sitting back door, and the second getting lost behind the play. The third goal was his finest, forcing a turnover before receiving a pass from Joel Farabee, who had a natural hat trick of his own against Kazakhstan, and beating Samuel Ersson. The U.S. only took two penalties in the game, the only downside of that being they occurred four seconds apart. Josh Norris was called for cross-checking and off of the ensuing face-off, Dylan Samberg flipped the puck into the crowd trying to clear it. However, the U.S. hung in there. Sweden had one really prime opportunity that was stopped by Keyser, one of his 28 saves. There was that Poehling clear and clears by Phil Kemp and K’Andre Miller as the U.S. navigated through a span of 1:56 down two men. With 5 minutes remaining in the opening period and down 1-0, another goal could’ve sunk the Americans. After the kill, it was a moment that looking back could have been a turning point if they did end up coming back in this game. Through three games, the U.S. has now killed off all seven of its penalties. Switzerland is the only other team to not surrender a shorthanded goal, killing off all 11 of their instances down a man. On the other side of the special teams’ coin, the U.S. went 2-for-3 on the power play. Their total 5-for-12 conversion rate (41.7%) is the top mark in the tournament. Jack Drury didn’t factor much into the United States’ opener vs. Slovakia, but tonight the Winnetka, Ill., native made his presence felt. With Jack Hughes still listed as day-to-day with an injury, the Harvard freshman stepped up and was strong on the forecheck eliminate the time and space for the Swedes’ potent blueline crew. He certainly showed that tonight. 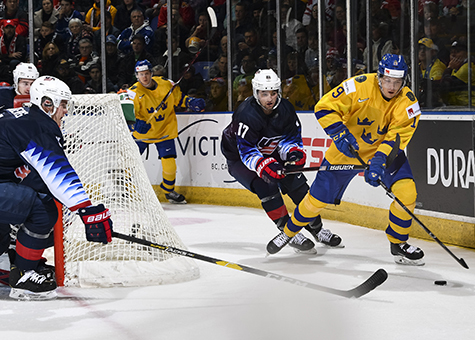 The comeback against Sweden was huge and it netted the U.S. a point, giving them seven for the preliminary round. While Sweden has a hold on the top seed of Group B, the U.S. will control its own destiny against Finland (2-0-0-1), who are currently in third place in the group with six points. The Finns fell to Sweden, 2-1, in its opener before the Nordic nation beat both Kazakhstan and Slovakia by scores of 5-0 and 5-1, respectively. Finland have a trio of players who have played in the NHL this season. Defenseman Henrik Jokiharju (Chicago, 32 GP) and Urho Vaakanainen (Boston, 2 GP) as well as forward Eeli Tolvanen (Nashville, 7 GP). Four players have a team-leading three points, Jokiharju, forward Aarne Talvitie (NJ), 2019 NHL Draft Eligible Kaapo Kakko and the Scottsdale, Ariz., born Jesse Ylonen (MTL). Buffalo Sabres prospect Ukko-Pekka Luukkonen, who has a 1.52 goals-against average and 94.3 save percentage in two WJC appearances, will likely get the start in net.